it was a cloudy morning at skaket beach last week, but that didn't really matter. The amphitheater quality of that space at low tide is magnificent in any weather, and watching the early risers enjoy the beach and each other I felt, strangely, that the sun was not needed. There were two little boys practicing their slide boards in a puddle while mom and dad chatted and watched. The younger boy was in constant motion and utterance. "my turn!" floated urgently over the flats. Mom and Dad gave each other a high five and I wanted to give one to the whole happy family. Right by them went a very nice couple holding hands. 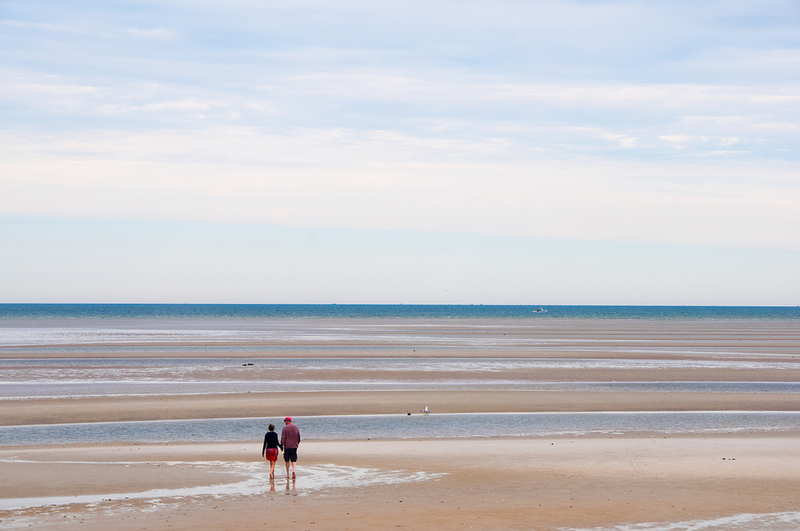 I watched them out onto the flats, until I almost couldn't see them; it seemed they were going to walk all the way to Provincetown, holding hands forever. I never even walked. I just stood up at the top and watched these people quietly happy on the beach below. There was so much good cheer that they didn't need the sun - they made the light. Posted on July 24, 2014 by Robert Manz Studio.